Sunflower Shoots are gaced with a nutty flavor and a crunchy texture, sunflower microgreens are nothing short of awesome in sandwiches, soups, salads, scrambled eggs, and wraps. Both the leaves and the stems are edible These wonderful Greens are an excellent source of powerful “super food” and important source of non-meat Protein. Health Benefits of Sunflower Shoots: High in protein, zinc, omega fatty acids, B vitamins, folate, and LIVING enzymes. Vitamin E for boosted antioxidant capacity with vitamin C and selenium to reduce blood pressure and prevent heart disease.Contain Selenium and Vitamin E, which work together as antioxidants to protect your cells from potentially cancer-causing free-radical damage, as well as provide Vitamins A, E and D , Folate and other B Vitamins. They contain minerals including Calcium, Copper, Iron, Magnesium, Potassium, Phosphorus and Zinc. Also known as a rich source of Lecithin (which helps break down fatty acids into easily digestible form and balance Cholesterol as it soaks up “bad Cholesterol” and prevents it from being absorbed, neutralizes toxins and purifies the lymphatic system ), Sunflower Sprouts have abundant Chlorophyll for the healthy functions within the body, including tissue repair and vitalization, reducing inflammation, built up blood, Enzyme activation and are a natural body deodorant. *You may substitute lemon juice with balsamic or red wine vinegar. Slice baby beets about 1/4 inch thick. Slice avocados to about the same thickness. Slice a few in half-keep a few long. Drizzle 1 Tbsp lemon juice on avocado. Set beets and avocado aside. Rough chop pea shoots. Set the sprouted (leafed) ends aside. Place the hard stalk ends in a small bowl. Add the olive oil, lemon juice or vinegar, salt and pepper to the stalk pea shoots bowl. Mix well. Place a few of the marinated stalks on serving plates. 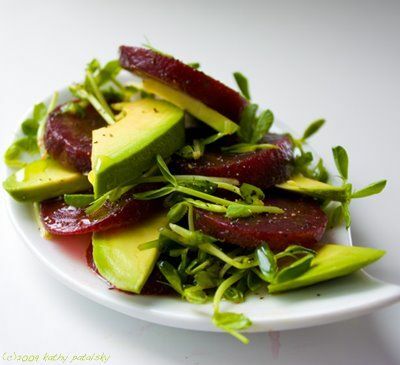 Arrange avocado and beet slices on top of stalks on plates. Rotate beet, avocado, beet, avocado. Add all the remaining pea shoots-stuff them into crevices on the plate to keep it tight and pretty. Drizzle the leftover oil-acid mixture over the salads. Optional: drizzle a bit more olive oil or lemon juice or vinegar over beets. Fresh grind black pepper is a nice salad topper. 4 cups salad greens – arugula and spinach both work well. Place all the sunflower seed dressing ingredients into your high-powered blender and blend on high until smooth. Oil and preheat your grill to high. Toss the Squash and corn with the oil and sea salt. Grill on high, turning the Squashonce and the corn a few times. Cook the Squash for 3-4 minutes per side and the corn for 10 minutes. When the corn is cool enough to touch, cut off the kernels. Layer the salad greens, sunflower shoots, chickpeas, cabbage, sunflower seeds, dill, and the grilled Squash and corn in a large salad bowl. Pour the dressing over the top and toss to coat. Place in a chutney grinder with the sunflower seeds, cashew nuts, a little salt and water. Blitz till creamy or textural, as per your liking. Spoon the mix from the sides and blitz again till the required consistency is reached. Remove into a bowl, add the nutritional yeast flakes, and adjust the salt and water. A drizzle of extra virgin olive would not hurt. Some crispy capers or a sprinkling of toasted sesame seeds are very tasty too.